A move which flew under the radar for the Padres this offseason was the signing of left-handed reliever Aaron Loup to a one year deal. 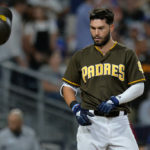 After taking a step back last season, Loup needs to bounce back if the Padres’ bullpen is to be successful in 2019. 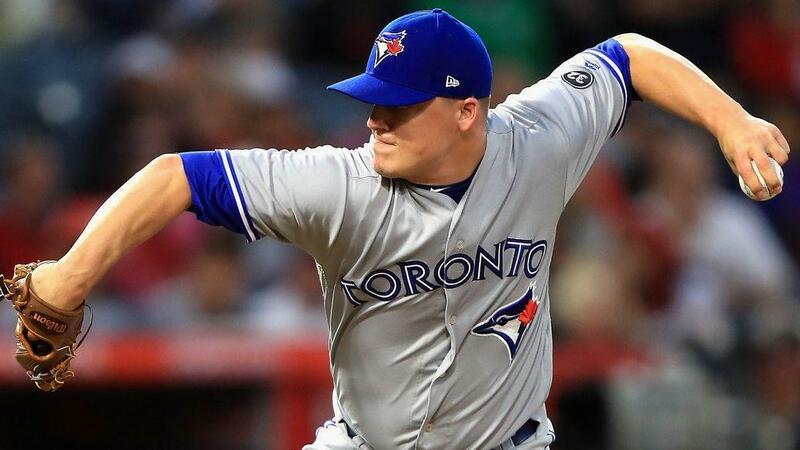 On February 17, the Padres signed Aaron Loup to a one year deal worth $1.4 million, with a team option for 2020. Two weeks later, the Padres placed left-hander Jose Castillo on the 60-day disabled list, making Loup’s acquisition that much more valuable. The loss of Castillo for at least the first few months of the season was a hefty blow. After Castillo posted a 3.29 ERA along with a dominant 12.21 K/9 last season as a rookie, it seemed as though he had solidified his case as the go-to lefty to take the mound in high leverage situations in 2019. Unfortunately, Castillo will remain out for a decent amount of the season. And looking at the remainder of the left-handed pitchers on the 40-man roster, all appear to be either inexperienced or will enact different roles. 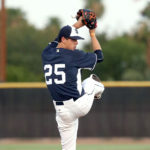 Matt Strahm will most likely be in the starting rotation, Robbie Erlin is more suited for a long-relief role, and 6-foot-9 rookie Brad Wieck has pitched a total of 11 innings in his big league career. 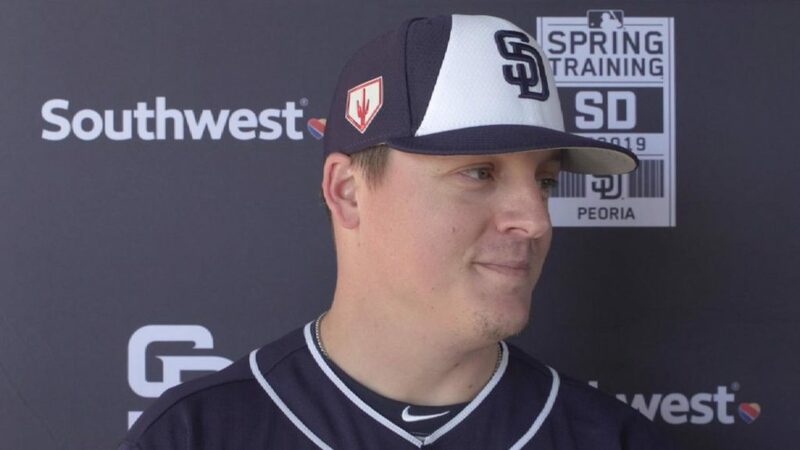 Consequently, Aaron Loup will become the primary left-handed reliever out of the Padres bullpen. 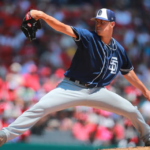 This will be a tall task for the 31-year-old Loup, who posted a 4.54 ERA and a 1.56 WHIP last season, considering the Padres winning ambitions in 2019. 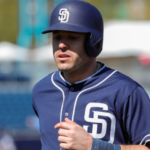 However, can the Padres expect Loup to return to his former effectiveness in 2019? A few numbers stick out about Loup from last season. Loup’s 31.8% swing percentage on pitches outside the strike zone was the highest of his career. Additionally, his 11.5% swinging strike percentage was also the highest of his career. 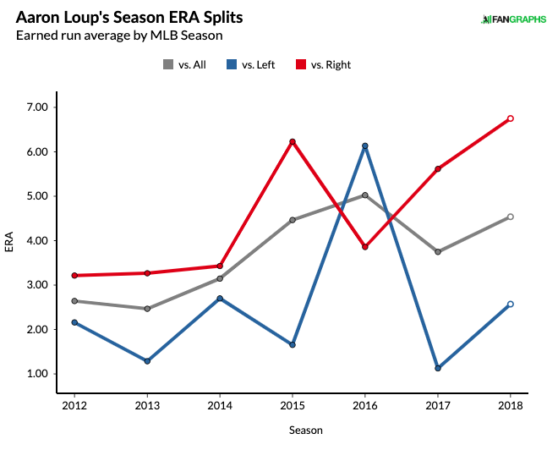 Therefore, it’s clear that Loup is missing more bats than ever before, a trend which may be explained through how Loup has reinvented himself as a pitcher over the past couple of seasons. Back when Loup debuted in 2012, he was a much different pitcher than he is now. Loup primarily relied on a power sinker which sat at around 93 MPH to go along with a curveball which he used 20% of the time. However, after struggling with run prevention in 2015 and 2016, Loup entered 2017 with a new pitch, a cutter. Since then, Loup’s cutter has been his most effective pitch, drawing more swings and misses than any other pitch in his repertoire. As a result, although Loup’s ERA has been inflated, his effectiveness against left-handed hitters has remained solid. 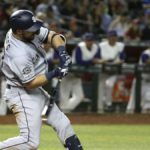 While Loup remains ineffective against right-handed pitchers, the Padres have plenty of proven firepower against right-handed hitters already. Craig Stammen, Kirby Yates, and Robert Stock all dominated against right-handers last season. Although MLB recently announced that pitchers will need to face a minimum of three batters per appearance starting in 2020, expect Andy Green to take advantage of the rules that are still in place by utilizing Loup almost exclusively against lefties this season. 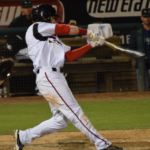 Loup’s success is certainly not guaranteed in 2019. However, the left-hander is proving he can strike out more hitters than ever before. And that should at least be a sign for optimism in the absence of Jose Castillo. 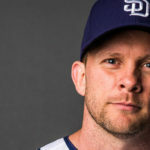 Previous Where is the Love for Former Padres’ LHP Mark Davis?